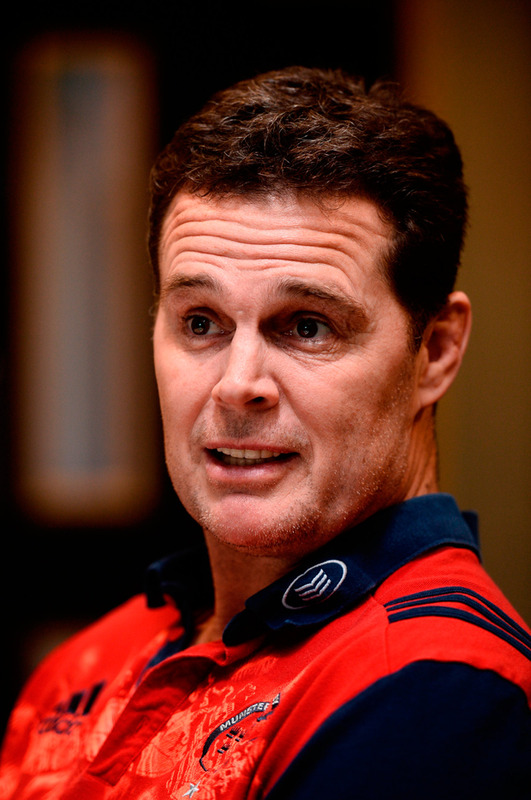 It is a day, says Rassie Erasmus, that will live with him for ever, a shocking experience which Munster's director of rugby still struggles to comprehend. But when his side return to Paris today, the scene of that dreadful occasion in mid-October when head coach Anthony Foley died in his sleep from a heart condition, among the many emotions Erasmus will feel is one of strength in adversity. "I'm sure I made mistakes that morning but what I do know is that the situation could not have been better handled by everybody, be it Munster people, the European organisers, Racing and the fans from both clubs," he says. "In fact, I can't wait to get to Paris to be with those people again. Sure, I don't know how we will be on the flight and even out on the field, although we didn't even get to the stadium that day, but there a lot of good people around. "It will be an emotional challenge for us but we have had plenty of those to deal with." There will be an outpouring of grief prior to and during today's match at the Stade Yves-du-Manoir, rearranged owing to the tragic events on the opening round of the Champions Cup. But nothing will compare to the horror of the day itself. "We will never get over it," said Erasmus. The former Springbok was waiting downstairs at the Novotel in Suresnes on the western fringes of Paris for the customary Sunday morning forwards meeting with Foley ahead of a lineout session in the hotel car park when it became clear something was wrong. "Axel is usually the first there so it was a bit strange but we just thought there had been a muddle with the time difference. We couldn't get him on the phone so one of the management went to his room," he recalls. "It was shocking, of course it was, horrible and unreal. The rest of the week was a bit of a blur but that day is still clear. Everyone will always remember those events. "It was an absolute shock, to your system, to your emotions, to your reality. Everyone was standing around that day. What do you do? "Usually the routine is so familiar, you get the team together and off you go. That day, you didn't know what to do. To talk or not to talk? Where do we go? Do you wait for the paramedics to arrive? Do you tell the captain? Do you tell the rest of the coaches? "And then, instead of going to the ground, we are on a flight back to Ireland." For today's return Munster are staying in a different hotel but everything else remains the same. They insist that their own preparation has not been affected in that they have had constant reminders of Foley ever since that fateful day. "The boys made a conscious decision to talk about Axel as often as it might be usual to do so," said Erasmus. "His office is right next to mine and the memories will always be there. He remains part of our daily experience. That is how we have approached it, lived with it. We want it to be a constant. "This week's preparation has been like that, no different. "Of course, the week following was a challenge, unreal. Axel's father, Brendan, was on the flight home. "Next morning, you wake up, full of feelings and then you realise that Axel's wife, Olive, and their two boys, Tony and Dan, got the news by phone and you try to imagine how devastated they must be. "I don't know how we got through that week, with the funeral, the boys in the huddle with the players before kick-off against Glasgow, and everything really. But we did." And how. Glasgow, who had thumped Leicester on the opening weekend, were beaten, 38-17, on a day of Thomond Park tumult, 14-man Munster (Keith Earls was sent off) riding a wave of emotion, just as they have done ever since. The team had had a bumpy start to the season but have won nine of their 10 matches since the Racing postponement. They head to Paris as clear leaders in the Pro12 with their only reverse an 18-16 loss at Welford Road the week after Leicester had been thrashed 38-0 in Limerick. It has been a dramatic about-turn in fortunes. The Glasgow performance was an elemental one but passion alone can only take you so far. How then to rationalise the Munster of today to the Munster of pre-Racing days? "Axel and I were talking about this on the evening before the Racing match, feeling that we were about to turn a corner," says Erasmus. "It is a young team but very coachable, very mouldable. And that was starting to show. "Who knows how long it would have taken? I am very realistic as to where we are in our progression. We have done well, very well lately, and credit to the guys, but we are far from being a bullet-proof team yet. "And yes, emotion has played a part. So too perspective. I know it's a bit of a cliché but it has been a reality check for us all. "Rugby means so much here in Munster but we know now it is not everything. If we are true to that belief then we can't put pressure on ourselves every week by saying this is a must-win game. We must just trust in each other and perform to our best." Erasmus has been a figurehead at Munster despite the difficulty of the circumstances, initially as the man edging out local hero Foley, and then the man at the helm thereafter. Tight-knit as the Munster community is, Erasmus has never felt an outsider. "The man who first embraced me into the fold was Axel," says Erasmus. "He made sure I settled in. He could have a grumpy face sometimes to the outside world but many of us know him with a smile in his heart. "Before we left for Paris it was Axel who was out with some boys on the pitch after our morning training session, chatting and playing while everyone else got changed. That was him, a special person. He had time for everyone, he cared for everyone." Ruaidhri O'Connor All the way up through the ranks Jack Conan was the most important player on his team. At 26, he is assuming that mantle for Leinster. Austin Healey The tale of two 10s, Owen Farrell and Tyler Bleyendaal, will provide a fascinating dynamic to the Saracens v Munster Champions Cup semi-final.